India’s security establishments have a doubt that Pakistani spy agencies were pumping fare notes of Rs 500 and Rs 1000. The total value of these fake notes in 2010 was around 1,600 crore. So it is clear that PM Modi has decided to impose a ban to put a stop on black money and corruption. What to do with the 500 and 1000 Rupee notes? People can deposit their money in bank accounts and post offices within 50 days from November 10 to December 30. You can also exchange your notes at the banks and post office from November 10 to November 24 by showing your valid identity card like Aadhaar card, PAN card, etc. In the transition period one can only withdraw 4000 Rs per day. If anyone is unable to deposit their money till December 30, they can visit the designated RBI office till March 31 and do the needful. New notes of Rs 500 and Rs 2000 will be introduced soon. What about the ATMs and Banks? Banks will be closed for public today. Withdrawals from ATMs will also be restricted today. 1. 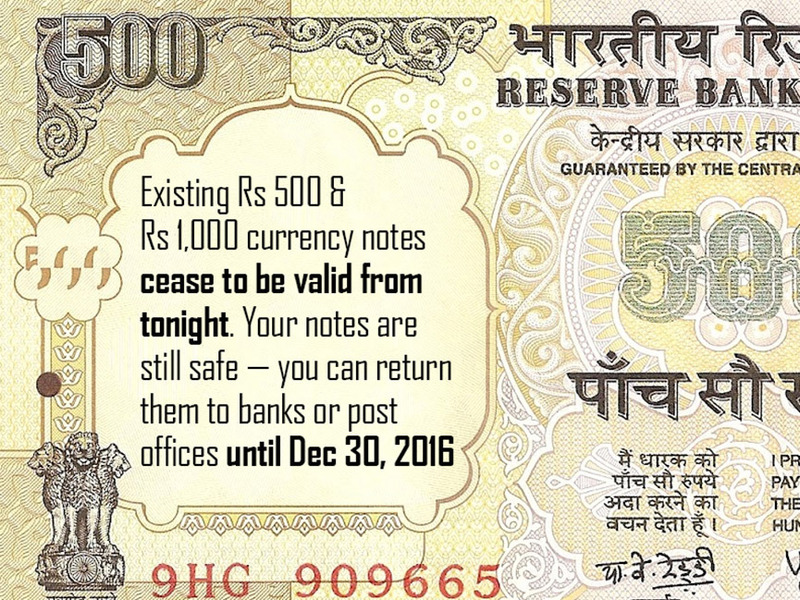 Old notes will be valid and accepted at the Government hospitals and Pharmacies for three days. 2. Railways and airways booking counters and also government buses. 3. Petrol stations like Indian oil, Hindustan Petroleum, ec. 4. Government authorised consumer stores and milk booths. People can withdraw new notes of Rs 500 and Rs 2000 from the bank accounts and post offices, with a limit of 10,000 Rs in a day and 20,000 Rs in a week. You can also withdraw from ATMs, with a temporary limit of Rs 2000-4000 per day.